GIVEAWAY | Taste Years of Family Tradition Through Mickey's Deli Original Pasta Sauce! - EAT WITH HOP! Home / CA / GIVEAWAY / HERMOSA BEACH / ITALIAN / LA COUNTY / MEDIA EVENT / GIVEAWAY | Taste Years of Family Tradition Through Mickey's Deli Original Pasta Sauce! GIVEAWAY | Taste Years of Family Tradition Through Mickey's Deli Original Pasta Sauce! So when I found out about Mickey's Deli, a restaurant located in Hermosa Beach, is well-known for it's Italian food, I knew I had to try it! And plus, it's by the beach! I love Hermosa Beach even though I've only been there once. I haven't had the chance to venture out into that area again but luckily, Mickey's Deli sent me some goodies as media. I love pasta, especially my mom's spaghetti (cue Eminem music), so getting the pasta sauce was perfect! Thanks Mickey's Deli for sending me some! I told my mom to prepare some spaghetti, so I can lather it up with some pasta sauce. YUMMMMMM! Ever since I was little, my mom would make spaghetti as that special "American" food as a treat. And every time she made it, it tasted so good! Mushrooms are my fave so she makes sure to put extra mushrooms for me. She doesn't make it as often anymore but I appreciate it even more now when she does. But at least I got her to try Mickey's Deli's pasta sauce! It tasted much different from the usual sauce my mom uses (Ragu sauce). Mickey's Deli's version tastes much more pure and has a subtle saltiness that isn't overpowering at all. It's also light! Just look at that pasta sauce glistening! I just poured some pasta sauce on it and VOILA! It's beautiful! Just need to add some mushrooms and meatballs! I love how easy it is to use this pasta sauce because I am such a lazy person. LOL Like seriously I wanted to make it easy on myself and just dump it on the spaghetti noodles. But it was still so tasty! Just remember to like warm it up on a pan first! I wish I took more pics to show y'all how I ate it, but hope you can imagine with the recommendations! this is great for chips and dip! put it in your sandwich! It'll make it more flavorful and so good! put it on your spaghetti like me! use it as dipping sauce for anything like burritos, tacos, taquitos, whatever! I am adding this place to my to-go list this winter break, so be on the lookout for another post on the actual restaurant itself! I am excited because the restaurant adds this sauce to everything like pizzas to calzones to sandwiches. It is what Mickey's Deli is famous for and how it got famous in the first place in the 1950's! This homemade sauce is carries on the family tradition and years of culture. Happy December y'all! I am so happy to team up with Mickey's Deli to give y'all something special for this season of giving! Well, every season is for giving though! So remember to always check back for giveaways every month! 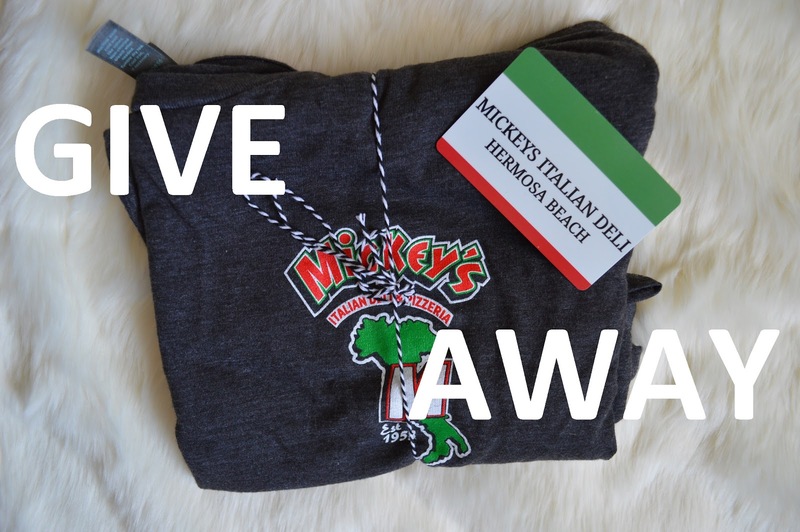 What you win: A $25 gift card to Mickey's Deli, an awesome shirt that's so soft to hide that food baby, and your very own special pasta sauce! I will be picking one (1) winner for this giveaway! 1. (Required) Comment below ↓↓ this post telling me what your favorite type of Italian food is!